The following is an excerpt from Adam Nayman’s forthcoming book Ben Wheatley: Confusion and Carnage, for The Critical Press, now available for preorder. Nayman will appear in person at Museum of the Moving Image on Saturday, October 29 at screenings of Kill List and Down Terrace. 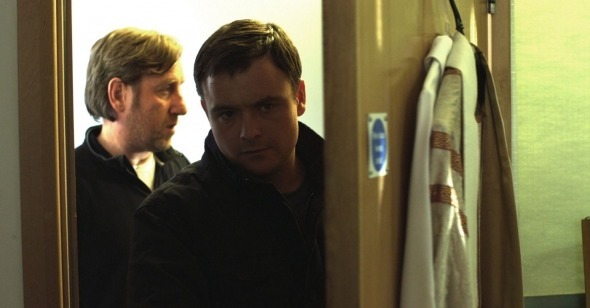 “God loves you,” says the fellow with the acoustic guitar to Jay (Neil Maskell), who has every reason to suspect he’s being lied to. An ex-military man who’s currently moonlighting as a freelance assassin, Jay hates himself and doesn’t exactly inspire feelings of affection in those around him either. He’s sullen and withdrawn, and his wife, Shel (MyAnna Buring), can barely stand his presence around the house. Their young son, Sam (Harry Simpson), meanwhile, regards him with wariness and awe. These words are a prophecy fulfilled: Kill List is a movie that ends with the Almighty giving its protagonist as wide a berth as possible. The demonic punch line is that Jay, who had previously bristled at a sing-along rendition of “Onward, Christian Soldiers” experiences his destiny as an agent of the other side. Tenderly adorned with thorns at the film’s climax, Jay stands in front of his tormentors—and the audience—as a kind of Antichrist Superstar. Tellingly, the final freeze-frame close-up is the first time in the film that Jay looks resigned, if not relaxed. The morbid inventory of the title has been checked off, and everybody who supposedly loved him is dead. But Somebody Down There likes him. Geography aside, the reasons for comparing Kill List to The Wicker Man are obvious. Like The Wicker Man, Wheatley’s film concerns a character who is tricked by the members of a cult into doing their bidding: just as Edward Woodward’s Sergeant Howie is systematically victimized by the conniving Lord Summerisle (Christopher Lee), Jay gets finessed by The Client (Struan Rodger), who hires him and Gal on without telling them much about their assignment. In both films, the protagonists awaken to the terrible nature of their manipulation in the middle of outdoor rituals; in both films, their entrapment is presented as both deeply shocking and retrospectively inevitable. In fact, few characters in film history have been more hilariously hoisted on their own petards than poor old Sergeant Howie, a self-styled Christian soldier whose one-man crusade to find a kidnapped little girl comes steeped in self-righteousness. “And what of the true God?” he snipes at Summerisle, who retorts that the man upstairs had his chance and, “in modern parlance,” blew it. The comeuppance in The Wicker Man is thus countercultural as a representative of the reigning social and religious establishment is taken down by a conspiracy of free-loving, animal-worshipping hippies. At the same time, it’s implied that Summerisle and his followers aren’t so much rebelling against modern society as trying to maintain a way of life that predates it—that they are the true keepers of the flame. As a horror movie, The Wicker Man is both less spooky and more whimsical than its reputation suggests. As a parable of values in collision, it’s downright profound: a darkly comic vision of isolationist utopianism running amok all over a judgmental outsider. In Wheatley’s film, though, the victim is also the last man standing. In the final shot, Jay is (freeze-) framed by Laurie Rose’s camera amidst a ring of fire. It’s an elegant visualization of the idea of a Pyrrhic victory, but the truly immolating aspect of Kill List – the twist that truly burns it into British horror movie history—draws from an adjacent wellspring of inspiration, as we will see later on. Appropriately for a film that ends on a triumphal note, Kill List represented in every way an expansion on the low-rent success of Down Terrace. It was made for exponentially more money (£700,000), and in the shade of raised expectations across the board from critics and fans. If the micro-budget Down Terrace was a family affair, Kill List was—appropriately—a slightly more mercenary endeavor, mirroring Jay’s cash-up-front vocation. One of sharpest points in Wheatley and Amy Jump’s screenplay is that “home” and “work” are hardly exclusive concepts. The film opens in the middle of a shouting match where Shel berates Jay for not earning enough money to keep their household afloat, and when his former army buddy Gal (Michael Smiley) offers the prospect of a subsidized hunting expedition, she isn’t appalled by its criminal implications. After dinner, she wishes her husband luck and kisses him goodbye. Certainly, the ongoing, afternoon-long argument between Jay and Shel sounds authentically anguished and the judiciously spliced establishing shots of Sheffield place them within a depressingly plausible real-world space. Figuratively speaking, Jay and Shel’s house is just down the road from the flat in Down Terrace, and while it’s conspicuously more spacious, its inhabitants seem similarly trapped by circumstance. Besides shooting his actors in anxious close-ups, Wheatley emphasizes their nervous energy through physical gestures, like having Jay spin around like a bored child on a kitchen chair while Shel harps on him for overspending on groceries. “You should have done me a list,” says Jay, passing the blame for the expensive haul back to his wife. It’s a line that cuts two ways: besides indicating that man-child Jay probably shouldn’t ever be left to his own devices, the dialogue anticipates the list that he’s soon going to be given for work purposes—and which he will follow, with a few diversions, until every item has been crossed off. One of the constant refrains in reviews of Kill List was that the film “changes” sometime around its midpoint from a realistic drama to a hyper-violent genre movie, and then again in its final third into an all-out horror picture. This is true enough, but in order to really apprehend what Wheatley and his collaborators are doing here, one has to see how carefully they’ve massaged these transitions beneath the skin of the film. For instance, the first time that we see Sam, he’s lying on the floor in his room, listening to his parents bickering and absentmindedly clanking together action figures beside a plastic grey castle play-set—a rather creepy-looking set-up that registers as the first of the film’s many subtly Medieval images. The motif extends into the very next sequence, where Jay slinks away to play with Sam, brandishing a lightweight foam sword and shields emblazoned with old-fashioned crests. (The father-son jostling recalls Bill and Karl’s faux punch-up in Down Terrace). Later, Sam asks for a bedtime story about King Arthur and is disappointed when Jay regales him with a tale that’s superficially chivalric and yet disturbingly couched in his own experiences about “two brave and honorable soldiers” stationed in Baghdad and fighting off insurgents. The leap from the iconography of the Crusades to the Iraq War is subtextually significant, but the scene’s power resides in its editing scheme. It cuts from Jay’s exit to Shel crying on the telephone while talking (in Swedish) to an unknown party; to Jay suddenly eavesdropping and walking sadly away to sit alone in the garage; to a quick but tender bedroom reconciliation confusingly overlaid with the audio of the phone call; to Shel and Sam attacking Jay in the backyard with their toy weapons and being laughingly vanquished. In addition to outlining, heightening and momentarily breaking all of the tensions already established within the household, this reconciliatory passage stands out for its sheer lyricism, a strangely out-of-place serenity that, like everything in Kill List, is eventually folded back into a sinister underlying design.